At Trillium Dental, we offer dental implants to help patients who have one or more missing teeth regain confidence in their smile. 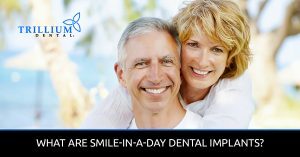 As opposed to traditional dental implants, we provide Smile-In-A-Day, which are same-day dental implants that look, feel, and function like real teeth. 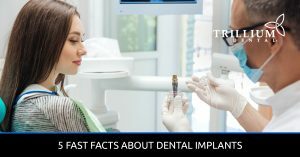 In our dental implant blog, you’ll find fast facts about dental implants, as well as reasons to consider Smile-In-A-Day if you have missing teeth. Aren’t sure if dental implants are right for you? 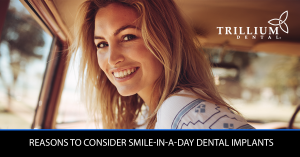 Learn what Smile-In-A-Day is and whether or not you would make a good candidate for this treatment. Our dentists are always available to answer your questions, so feel free to contact us anytime or book an appointment online! What Are Smile-In-A-Day Dental Implants?